I had oh so good intentions of getting things done around my house and in my craft area today but when I got a call from the answering service at 1 am and then worked until 5:30, I had to work some sleep into my day!! I have been wanting to play along with The Craft's Meow sketch challenge all month and well, you guessed it. Tonight is the cut off for submitting. So I did get a wee bit of time to make my card. I had some fun with all the embossing........a technique I am loving lately especially with my Distress Inks. 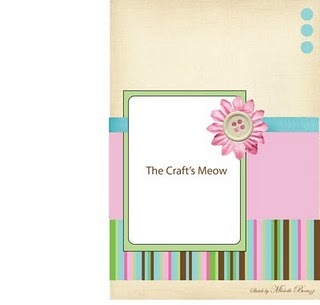 This flower from Happiness Is.......by The Craft's Meow, is PERFECT for this technique! The big floral image was stamped several times with Versamark and heat embossed with white Filigree embossing powder and then several shades of pinks and reds were sponged over the image. My floral panel was also embossed but with clear embossing powder and then Antique Linen was sponged over the images and around them for the distressed effect. My thatched background is a stamp that I LOVE. LOVE. LOVE. It is the Envelope Pattern stamp from Hero Arts. I also heat embossed it with clear EP. 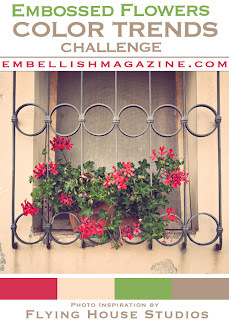 My color scheme came from the Embellish Magazine's: Embossed Flowers Color Trends Challenge. 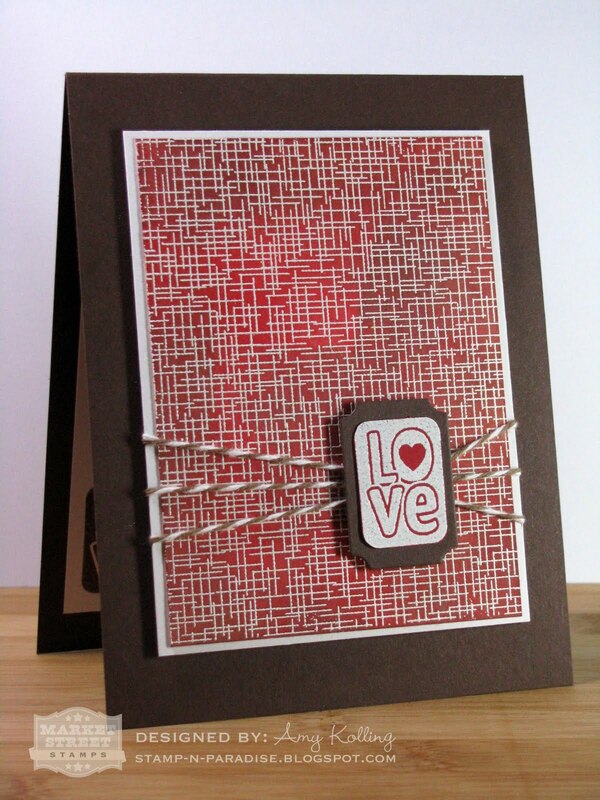 This also fits the challenge over at Lily Pad Cards this month: Emboss Resist. Have you heard of Annabelle Stamps? I recently came across them and they have some amazing designs. Just so happens they are a great sponsor of Wee Memories so stay tuned for that! Well, they are getting ready for their 2nd Birthday and are doing it celebration style. Go check out their blog post HERE to get all the details of the fun! How is everyone's weekend?! 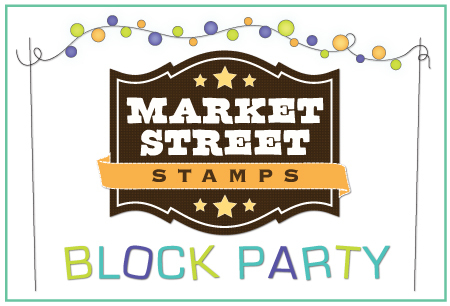 I'm off to more ball games but I have a card to share that I made for the Market Street Stamps Block Party going on right now! It is not too late.....so go get inky! 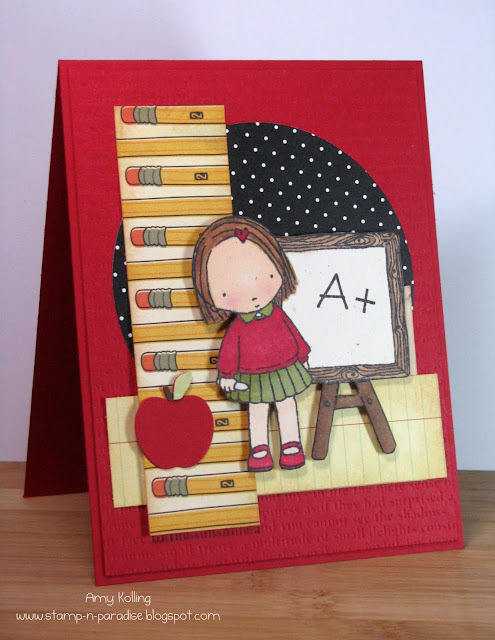 •Create a new project with MSS stamps! It can be anything (cards, layouts, altered items, etc. )- be creative and have FUN! 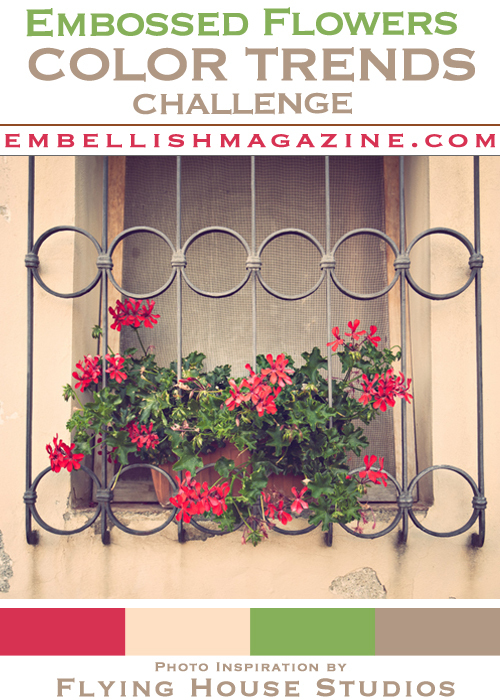 •Note: Your creations for this contest will not be considered for the Cream of the Crop contest. Each MSS contest or challenge requires a separate, unique entry to be eligible to win! •One randomly selected participant will win an awesome prize package full of yummy stamps & accessories! 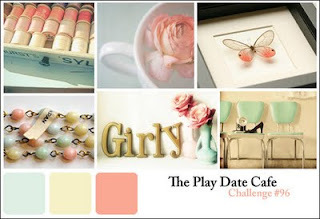 This week Market Street Stamps is also sponsoring The Play Date Cafe! So I had to play along with the beautiful color palette since I might just have some MSS! :) This card uses some DP from Lost and Found: Market Street (ironically) by MME. I tell ya, these papers are soo beautiful. I did some Copic coloring to the flowers from one of the newest release stamp sets: Autumn Greetings and fuzzy cut them out. And remember ALL of the new Market Street Stamps are available RIGHT NOW and can be purchased in our shop with a special discount of 15% OFF for one whole week! 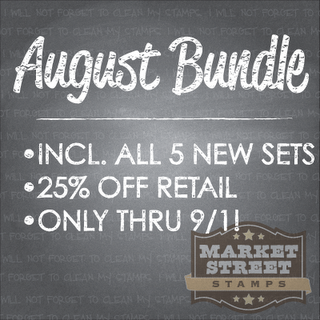 or if you gotta have 'em all......25% OFF ALL stamps if purchased in our AUGUST BUNDLE! I've heard from several of you who have ordered your new stamps already and can't wait to get them!!! I can't wait to see you next month in the Cream of the Crop or at the Block Party! Hope your weekend is starting off fabulous! We will be going non-stop to football and baseball games with our son all this weekend. This is in the midst of the first couple weeks of school for us here. 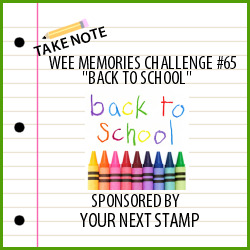 Are you ready for the first of the weekly challenges that start back up for Wee Memories? 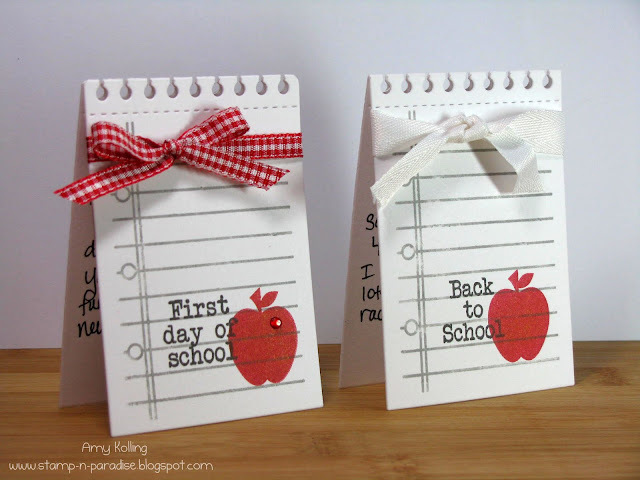 Well this week's challenge is all about BACK TO SCHOOL! I went back to the basics of coloring for my card using Copics. When I saw those crayons in the photo, I knew what stamp I wanted to use.......You Make the Grade by Pure Innocence. So absolutely adorable.....just makes me smile every time I see one of these little girls! Using another Viva la Verve sketch (this time week 3), I used some of my school themed papers in my stash that I believe are Cosmo Cricket but correct me if I'm wrong! I also got some use out of my PTI Impresssion Plate: Bookprint. 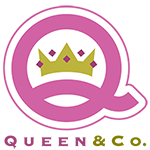 This week's sponsor is Your Next Stamp......go check them out. They have some amazing designs! I'm a bit late to the Papertrey Ink Blog Hop party but I made it! I just couldn't pass up that GORGEOUS inspiration photo and a chance to use my new Bloom Builder #3 Die. I sponged Victorian Velvet Distress Ink to the edges of my Damask pattern paper and roughed up the edges with my fingernail. My TANL leaf die was distressed a bit by running it through my Big Shot with the Linen IP. I'm sorry but I can't stop using my pattern paper from MME. This time---Lost and Found Two: Blush. 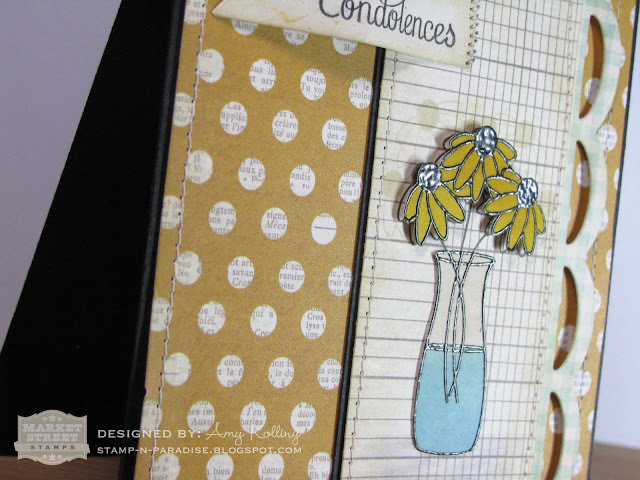 Everything coordinates beautifully and really takes the guess work out of using pattern paper. 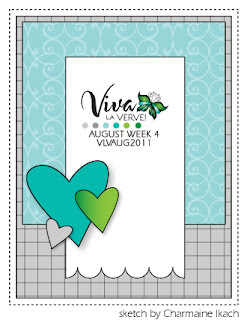 My card also uses another Viva la Verve sketch for August (week 2) .......I'm challenging myself to try them all this month! I did change the orientation of this sketch from vertical to horizontal as it fit better for my card elements. 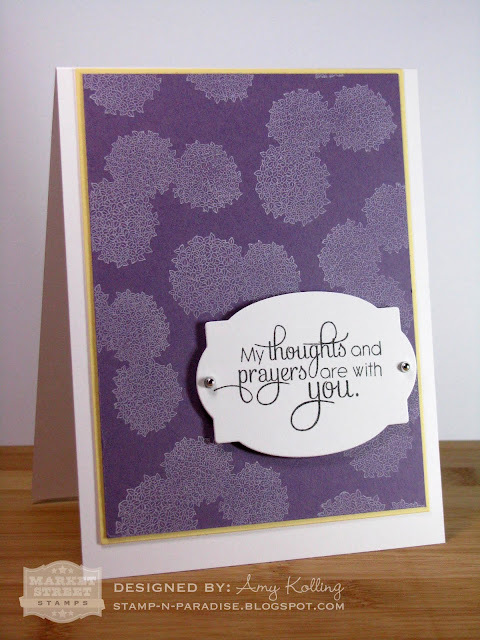 I have one last card to show you using Comforting Florals. For this card, I chose to NOT color my flowers. I simply stamped them on colored cardstock with white ink. There is so much detail and everything shows up beautifully! And if I haven't told you yet just how much I love the font in this set, I will now. I love it!!! My stamp arsenal has been missing something just like this. Alright, going to keep this short as I want you to hop on over to Market Street Stamps to get your own new releases and don't forget to see if you are one of the winners of some of these new stamps!!! Have you been enjoying the Market Street Stamps Sneak Peeks this week? If not, go check out the MSS blog and remember to leave comments on all DT posts and the blog post for a chance to win some stamps! Seriously, this month's sets are so fabulous. If you don't have any, you are missing out! 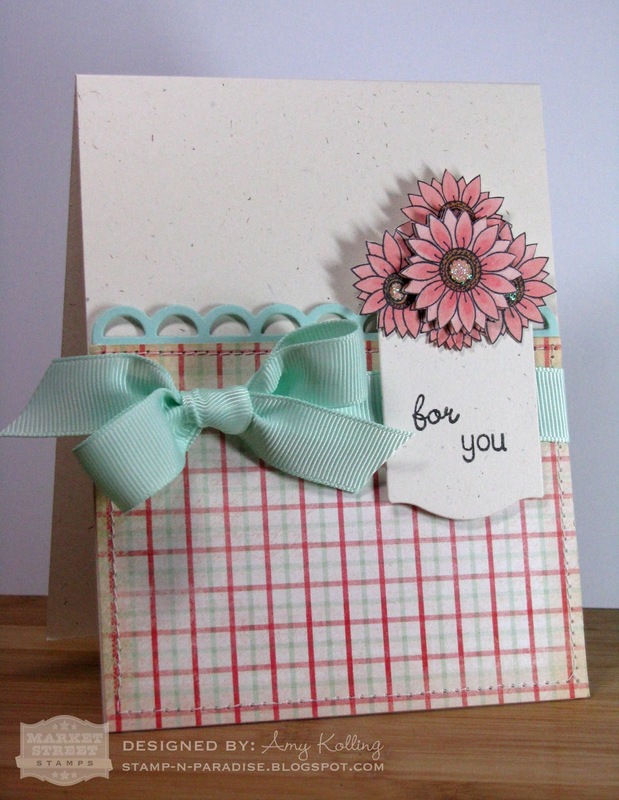 I am sharing a card made with the new background stamp: Gingham. If you have seen my previous MSS posts, then you know how much I love these FULL size background stamps available over at the Marketplace. This is such a great stamp to pair with those fall stamps that are also available this month too! I used the Gingham stamp in Dark Chocolate on a kraft card base. 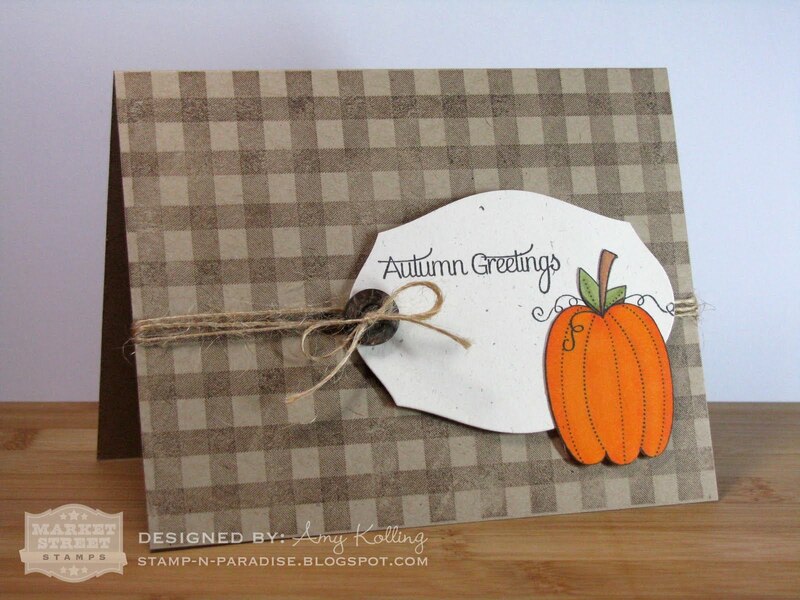 A paper pieced Copic colored pumpkin adorns the mat stack shape for a quick fall card. Did you look at all the inspiration yesterday using Autumn Wishes? Angelica even included a pumpkin "face" stamp so that you can make this as whimsical or traditional as you want! And look at that sentiment!? Such a beautiful font. Well, that's it for me tonight. Make sure to stop by the MSS blog tomorrow night for the complete reveal of the sets. Then you can order your own new release stamps over at Market Street Stamps!! Check below for a great special for the new stamps........your chance to get your own! •The August release stamps will be "sneaked" Monday-Wednesday at 7PM CST. •The full sets will be revealed on Thursday night. •Stamps will be available for sale following the reveal Thursday night. •Promotional Pricing for new release: 15% off individuals, 25% off all if purchased together. So I get these regular emails from my local scrapbook store when they update with what's "new" in the store. I always find a way to make it there to check it out. This card uses several new goodies I picked up last week. First up.....this awesome new Sunflower Die from Cheery Lynn Designs. Being from Kansas, I know I went through my stage of "collecting" sunflower decor when the country style of decorating was in. But what remains is that I love to see fields of sunflowers in Kansas! They are so full of color! Next, do you notice all that yummy pattern paper?? It is the newest line called Lost & Found Two: Sunshine by My Mind's Eye. Love, love. They are double sided goodness!!! My sentiment is also from a new purchase: Sunny Days by Verve. You will be seeing more of this set soon! 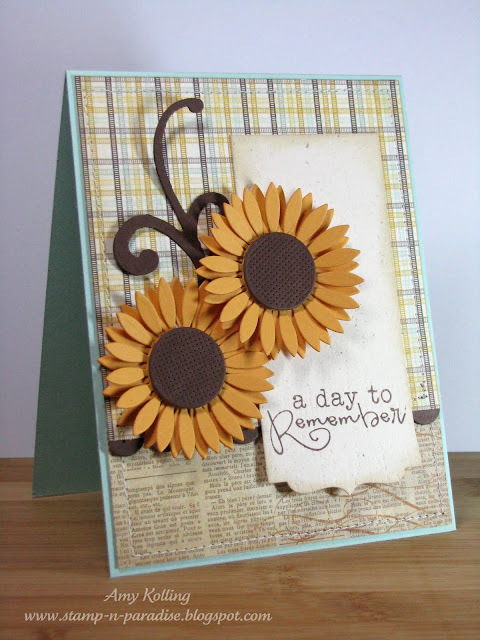 Here is a close up of the sunflower showing the detail to the middle part of the die. I used one of the Viva la Verve sketches for this card........VLVAUG2011. Have a great day everyone and thank you so much for stopping by!﻿ My next MSS post will be up tonight at 7pm CST. You can't miss it! Hi everyone! I have been waiting for today's post for a couple of days now. 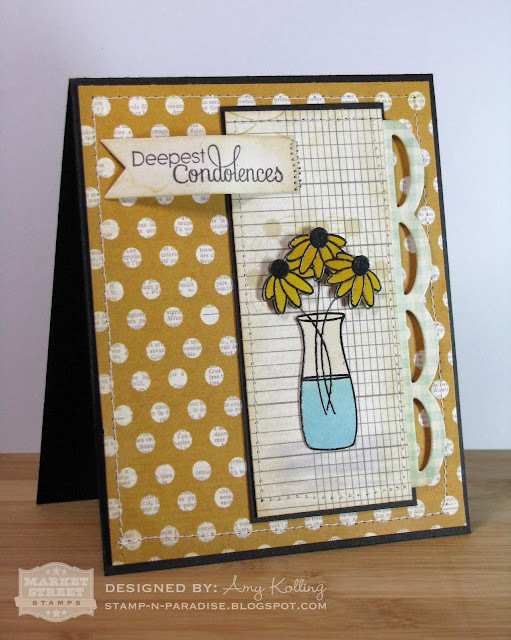 I am very excited as today is Sneak Peek day #1 of the newest releases for Market Street Stamps!﻿ I have the pleasure of showing off this fabulous..........Wait, did I say FABULOUS new floral set? Well, I did. It's called Comforting Florals. If you follow my blog at all, you might kinda know that I love floral stamps. :) So when I found out I'd be showcasing this set, I was soo very happy! Are you ready to see it? Sorry friends, nothing "simple" about this one. I had the new My Mind's Eye Lost and Found Two papers: Sunshine and just had to use these fabulous patterns with this set. 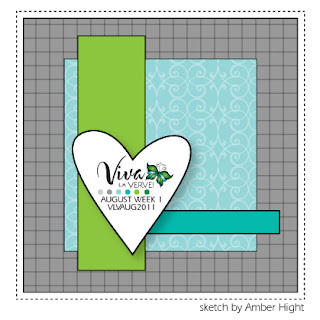 I also used the August Viva la Verve sketch Week 1 for my card. My card does use the sketch upside down. I had fun with some machine stitching and some diecut additions to this. I thought paper piecing the flowers and glass of water would be a nice change. My flowers were heat embossed with black embossing powder, colored with Distress Inks, and cut out. Check out the embossing and stitching here. What do you think so far? I will be back more this week with other samples using the new releases! So stay tuned! The August release stamps will be "sneaked" Monday-Wednesday at 7PM CST. The full sets will be revealed on Thursday night. Stamps will be available for sale following the reveal Thursday night. Promotional Pricing for new release: 15% off individuals, 25% off all if purchased together. It was back to school for us Tuesday or well the start of school if you want to look at it that way too. My son started 4th grade and my daughter started Kindergarten! I am so very proud to be their mom! I don't usually post pictures but I just have to post one. :) I'm a mom......what can I say? Here are the little cards that I slipped into their "mailboxes" the first day of school. I LOVE making this size or 3x3 for fun occasions or holidays. 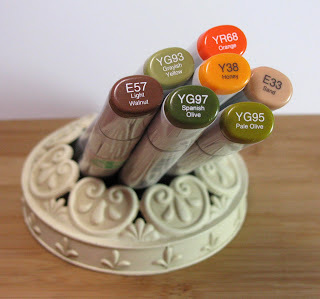 Today starts the new Sketch Challenge over on the Market Street Stamps blog. 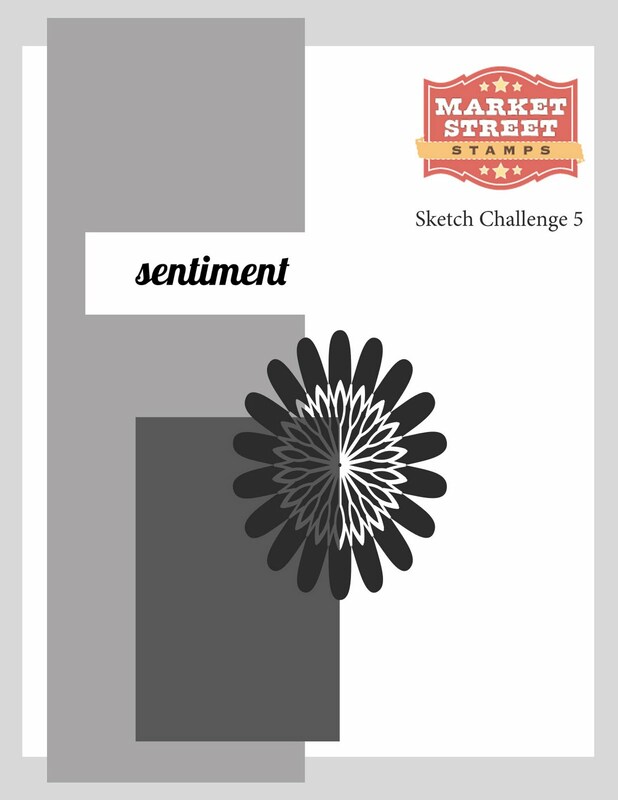 We'd love to see your creations using Market Street Stamps and our sketch. BTW, did you see the post over on the Market Street blog yesterday? 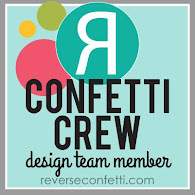 It was my first DT post.....I am still pinching myself that I am on this fantastic team and not to mention I get awesome stamps to play with too! I had to alter the sketch just a teensy bit........I put my sentiment on my flower panel and not at the top. And before you ask, YES, I did cut my stamp. I wanted to stamp the top of the flower separate from the stem. Just a few little snips and it was done. The center of my flower is the mini rolled rose die from MFT. Folks, I've had this die from the beginning and it's fabulous. Now for my card, I actually did try my hand at a rolled flower that I hand cut........No way was I using that thing! Turned out horrible. Why reinvent the wheel I say!! 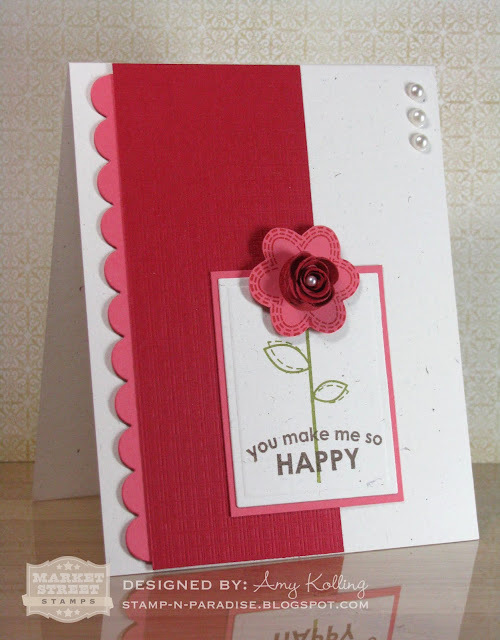 Today is my first official post over on the Market Street Stamps blog. The title of my post is truly how I felt the first time I used the background stamps available on Market Street! I have been longing for full card front background stamps for so long and these are fabulous!! Today I've used the Bit of Burlap background stamp with my Distress Inks. Starting with cardstock stamped in versamark and heat embossed with white embossing powder, I sponged on Barn Door Distress Ink. You can add a little or a lot. The color is up to you. Then going back over my panel with Tea Dye and Frayed Burlap Distress Inks to give it a weathered look. The LOVE sentiment is from the Hippie Chic stamp set and was white heat embossed on red cardstock, cut out, mounted on brown die cut shape, and popped up over my twine embellishment. I'm sure you will see me using lots of these background stamps.........they are a favorite of mine! 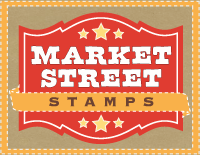 Do you have a favorite Market Street Stamp background? I'd love to hear yours! Don't forget tomorrow starts the Market Street Sketch challenge. So check back then for more inspiration using a SKETCH from the Design Team. Lil' Inker Rainbow Dies made that? It's no secret, I LOVE dies. Particularly ones that can be used for "other" things. I'm here today to show off the Rainbow Dies from Lil' Inker Designs. My daughter does not let me do her hair..........just a bow or barrette. Nothing fancy. But she's still all girl! I do not want to say how many photos it took to get this one that I liked! 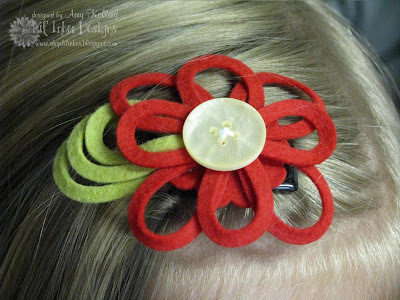 I wanted to make a flower for her hair out of the rainbow die and did using felt!! Let's see how I did it. I started with a small scalloped circle as a base for my flower. After diecutting the small rainbow 4 times, I had my "petals" and began adhering them in the pattern I wanted using a hot glue gun. Then again with another layer on top of that. I was then ready to attach my button to the center. I chose a Lemon Tart button from my stash and sewed it on using embroidery floss. Next up is the leaves. I die cut another rainbow ONE time using Simply Chartreuse felt. Using all three parts of the rainbow, I staggered them together to make my "leaf" as shown below. Then this leaf trio was tucked under the petal layer and glued using more hot glue. Here is the finished flower. The last step is to sew the flower on to the hair clip......I only had to use 2 stitches for this particular clip and it holds it well. And one last shot of the flower in my daughter's hair. Just so cute! We went to my local farmer's market this past Saturday and she wore it there. She had lots of compliments on it especially from some of the vendors that sold girls hair accessories!!! 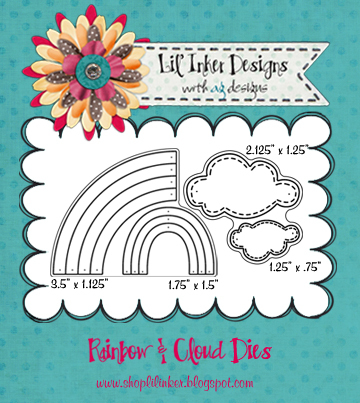 Does this give you any ideas in using the Lil' Inker rainbow die? 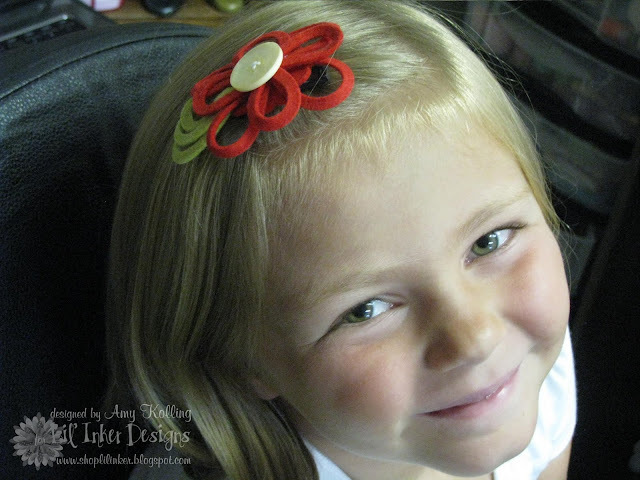 I hope I've inspired you today to find new uses for some of your dies in your stash. Besides, you may just come up with something pretty neat......at least in your kids' eyes! 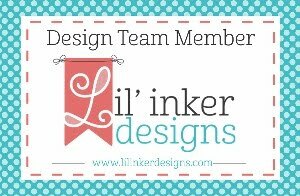 Lil' Inker Designs Kick Off Hop!! Color Cue #5 with Market Street Stamps!